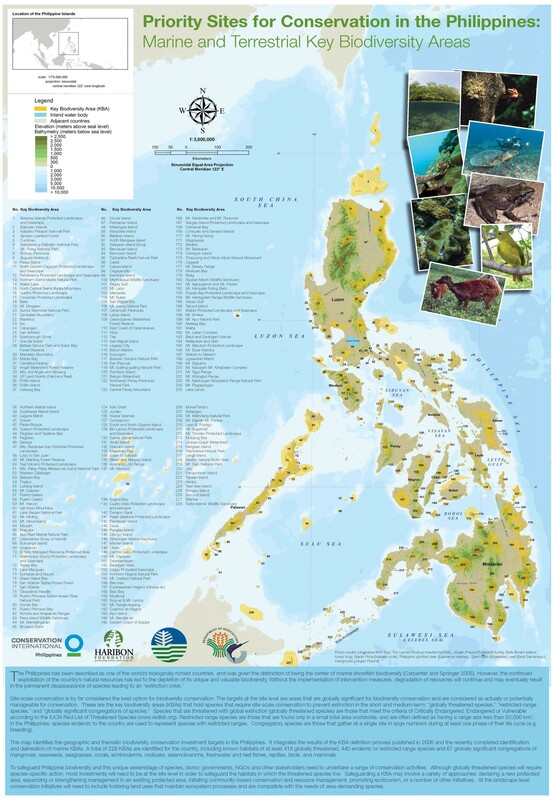 The Department of Environment and Natural Resources-Biodiversity Management Bureau (formerly the Protected Areas and Wildlife Bureau), teaming up with Conservation International Philippines (CI Philippines) and the Haribon Foundation, delineated terrestrial Key Biodiversity Areas (KBAs) in the Philippines in a 2006 publication entitled, “Priority Sites for Conservation in the Philippines: Key Biodiversity Areas.” The results of this effort was further supplemented with the identification of marine priority conservation areas in 2009, behind further efforts by CI Philippines, DENR-BMB, and the Department of Agriculture-Bureau of Fisheries and Aquatic Resources (DA-BFAR). 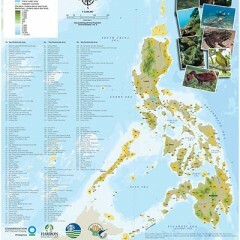 An integrated map showing the terrestrial and marine Key Biodiversity Areas of the Philippines. In brief, a total of 228 KBAs were identified in the Philippines, integrating a selection of 128 terrestrial and and 123 marine KBAs delineated in 2006 and 2009, respectively. These KBAs cover over 106,000 square kilometers and are home to 855 species, including 396 globally threatened, 398 restricted-range, and 61 congregatory species (see box story on KBA selection criteria). It’s important to note that while KBAs are recognized as priority conservation areas, not all of them are covered by proper legislative measures at the time of writing. In fact, majority of them remain unprotected or at least only partially protected. This table summarizes the number of Key Biodiversity Areas identified in the Philippines as of 2009. It is worthy of note that nearly 80% of the total number remains inadequately covered by conservation-related legislation. Adapted from Ambal RGR, et al (2012). The KBA-based conservation approach follows globally sanctioned commitments to establish priority biodiversity protection sites such as the Convention on Biological Diversity (CBD) and the World Summit for Sustainable Development (WSSD). Site-scale conservation is currently the best accepted norm for conservation efforts as the target areas include natural territories of the world’s most vulnerable species while also providing the best potential for manageable and sustainable conservation approaches. Furthermore, the combined efforts of the triumvirate of CI Philippines, DENR-BMB, and Haribon Foundation serve to reinforce and refine the mandate of the NIPAS (National Integrated Protected Areas System) Act of 1992. Adopting a more educated, modern perspective on biodiversity conservation, the identification of KBAs now enjoins governance efforts on various scales – from national parks to indigenous and community conserved areas (ICCAs) to private reserves, relying on a per-case assessment of the best conservation approaches and, in effect, promoting the pursuit of reliable and sustainable solutions built from the ground up. For more information on the identified KBAs, you may view the reference reports in full through the list of reference sources provided below. Criterion 1: Globally-threatened species (vulnerable species) - Locations that exhibit a regular occurrence of one or more globally threatened species, as identified by the IUCN Red List, are considered KBAs. 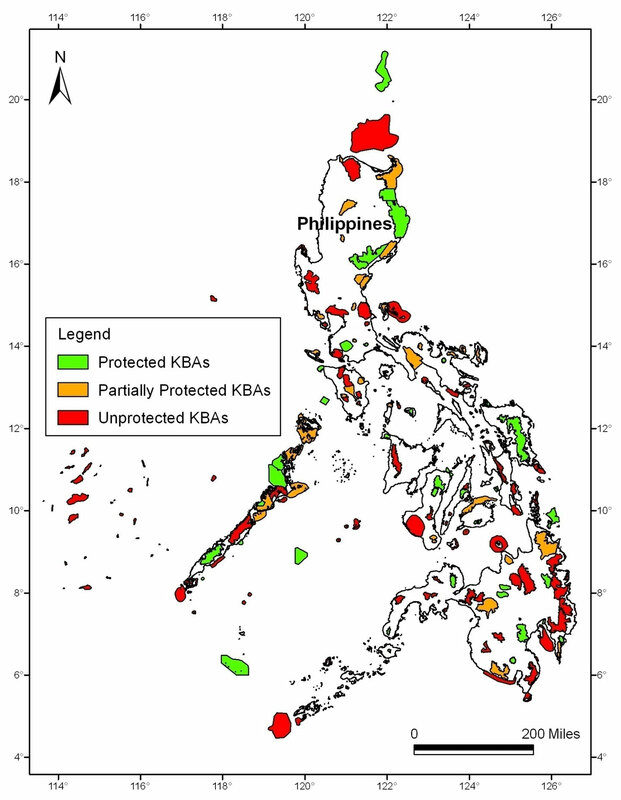 Criterion 2: Restricted-range species (irreplaceable species) - In the case of the Philippines, where data for range and population sizes are still lacking, endemic species were used as reference for identifying KBAs based on restricted range species. Criterion 3: Congregatory species (irreplaceable species) - KBAs may also be defined according to an area’s function as a site where at least 1% of the global population of species gather in large numbers during some stage in their life cycle (e.g. breeding). Further, the KBAs are a refinement of existing lists of priority conservation sites as already defined by the Philippine Biodiversity Conservation Priority-setting Program (PBCPP) of 2002, among others.